American higher education is increasingly in trouble. Universities are facing an uncertain and unsettling future with free speech suppression, out-of-control Federal student aid programs, soaring administrative costs, and intercollegiate athletics mired in corruption. 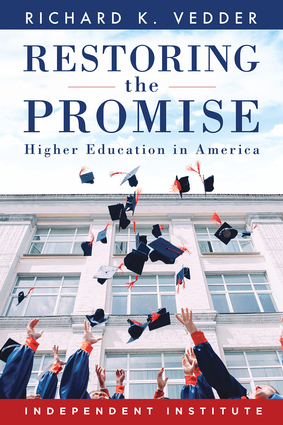 Restoring the Promise explores these issues and exposes the federal government's role in contributing to them. With up-to-date discussions of the most recent developments on university campuses, this book is the most comprehensive assessment of universities in recent years. Richard K. Vedder is Senior Fellow at The Independent Institute. He has been Senior Economist at the U.S. Joint Economic Committee and Visiting Fellow at the Center for the Study of American Business, Washington University. He is the author of Going Broke by Degree: Why College Costs Too Much. His articles have appeared in numerous scholarly journals, the Wall Street Journal, Christian Science Monitor, National Review, Washington Times, and Investor's Business Daily.